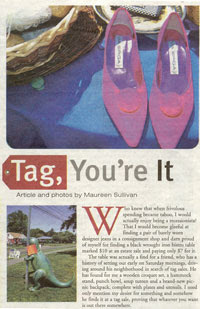 This morning's Springfield Republican insert contained an interesting article by Maureen Sullivan about local tag sales. For those of you who do not normally engage in this Friday/ Saturday (and sometimes Sunday) hunt for treasure, you might be surprised at the number of people that do it. Tag sales are a seasonal event starting in early May when the weather turns warmer and ending in late October when leaf raking and colder weather return. For the past four years, I have been posting FREE tag sale listings on the LongmeadowBiz website and introduced a feature called Tag Sale Map Locator to make the journey easier. 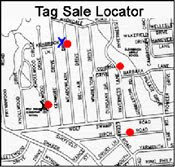 It is a map of Longmeadow with all of the upcoming tag sales marked and day coded (Fri/Sat/Sun). This Saturday (tomorrow) has an abundance of tag sales (12 different ones) in Longmeadow. Many diehard "tagsalers" create their own map so I usually take some time handing out the free computer generated tag sale maps in an effort to teach these "diehard" addicts. Don't count on me being there to give you one. Take the time now to print your own copy! Don't forget.... we usually have the most complete list of tag sales. Check the new listings every week (usually posted by Thursday night) and if you are planning to have your own tag sale, submit your free listing (and save the cost of advertising in The Reminder or Springfield Newspaper!). What's the best mix for Longmeadow? In my opinion, our present situation, in which we behave as individualistic citizens within a form of government designed for communal notions of citizenship, is contributing to ugly local politics and public cynicism. If consistency between form and function is too unrealistic, maybe efforts to transform our town's politics from our present inconsistency to another less destructive one would be more realistic. Maybe we'd be better off with a form of government designed to provide "public services" in an efficient and professional manner that is consistent with our dominant behavioral assumptions (i.e. that taxpayers should get a fair deal), and a renewed townwide commitment to encouraging citizens to see the town as a family and to be active family members who put the interests of the town family on at least the same plane as the interests of their nuclear family. I think behaving like communitarians (each citizen considers himself a legitimate policy maker whether or not elected to office) in an individualistic system (professionalized municipal government) may be more productive than the reverse, which is our present condition. One of the reasons my family left Springfield to come to Longmeadow was that the imposition of the Finance Control Board exacerbated and further legitimized an individualistic-consumer mentality among citizens, reducing community membership to a financial arrangement in which residents come and stay because the city provides a "good deal," and reducing political activism to competitive special interest advocacy. The destructive flip side of this approach is that residents, like consumers, have less incentive to maintain civic (read brand) loyalty when times get tough. Rather, the "rational thing to do" is find a better deal elsewhere. Those who stay, on the other hand, are drawn into a political competition for resources, rather than a deliberative democratic debate about the public interest. The Duquettes came to Longmeadow because of the schools and because of the opportunity to live in, and even help shape, a community held together by a shared identity and spirit. The opportunity remains, but it requires a renewed commitment by our community's leaders to be more fully realized. Our dedicated and talented webmaster, Jim Moran, wrote a post in this space prior to our local election in which he argued for a "balanced" approach to leadership and the distribution of town resources, as well as to the consideration of our town's priorities. The argument was reasonable and fair minded, and it also reveals the dominant notion of Democratic citizenship and community in Longmeadow today. Despite our founding as a classical democratic community where citizen participation in politics was embedded in our community's institutions and culture, we are now a thoroughly liberal individualistic "community" that expects elected officials to govern in the interests of voters. The classical notion of citizen governance alive at Longmeadow's birth lives on in the laments of the few active members of our community, and more importantly, in our form of government - the town meeting. Unfortunately, the present incompatibility between our operational theory of citizenship and our form of government has caused considerable harm our politics. Frustrated by (and unaware of) the conflict between our behavioral and theoretical assumptions about community and citizenship, many townspeople become angry and bitter. The result is more acrimony in our politics and more townspeople opting out of politics to avoid the bickering. This leaves us often with the worst of both worlds; elite participants operating in a system designed for mass participation. One need only look at the Masslive Longmeadow forum to see how this arrangement deranges the perceptions of some residents. Longmeadow's politics has too often been reduced to a competition for scarce resources; a competition that pits different constituencies in town against each other. The most enduring rift seems to be between those for whom our schools are most important, central to our town's character and identity, and those for whom our schools are important, but no more so than other town "services." Our language clearly illustrates both this division and the reigning individualistic assumption that this dispute requires "balance" and a "fair distribution" of resources between "competing priorities/interests." We talk about the "town-side and the schools-side. We seem to agree that notions of our town's priorities should be clearly articulated by leaders and should be funded according to their order of priority. These linguistic themes are treated as common sense and we are thus thoroughly entrenched in a liberal individualist political culture, without any consciousness of how this liberal approach clashes with our participatory governing institutions and communitarian aspirations. If the people of Longmeadow wish to live in a liberal-individualistic political community that sees politics as a competition for resources between disparate visions of the public interest ("ambition v. ambition") it can and should do so, but it cannot continue to be operationally Madisonian and institutionally and rhetorically Tocquevillian. Either we must change our institutions and expectations to fit our present liberal-individualistic behavior, or we must seek to re-invigorate the more communitarian notions of democratic citizenship and community upon which our town was founded and our form of government was designed. Should we define the public interest of our town the way every place else seems to in America, as the result of compromise between competing and distinct interests? Or, should we try to re-build the notion of citizenship and community that made Longmeadow distinct from other places; a notion of community in which members equate their self interest with that of the community, much like family members. An effort to revive "self interest rightly understood" would be my personal preference because, among other things, it would help mitigate the disconnect between the standards by which we judge politics in our town and the institutions and procedures through which we conduct it.